Gravy is our journal and podcast duo of original narratives that are fresh, unexpected, and thought-provoking. Not long after the evening service started, a man named David stood up from the front pew and began to sing “Amazing Grace” in a lovely, gentle voice. He was middle-aged, neatly dressed, and quite drunk. That last fact was confirmed when he stopped singing and started to testify. “You know what?” he asked the congregation. As he continued to talk, at some length, the pastor, Brian Combs, edged toward him. We laughed, Pastor Brian whispered in his ear, and David shut up. Soon it was time for communion, and we shuffled toward the altar and tore hunks from a crusty French loaf. 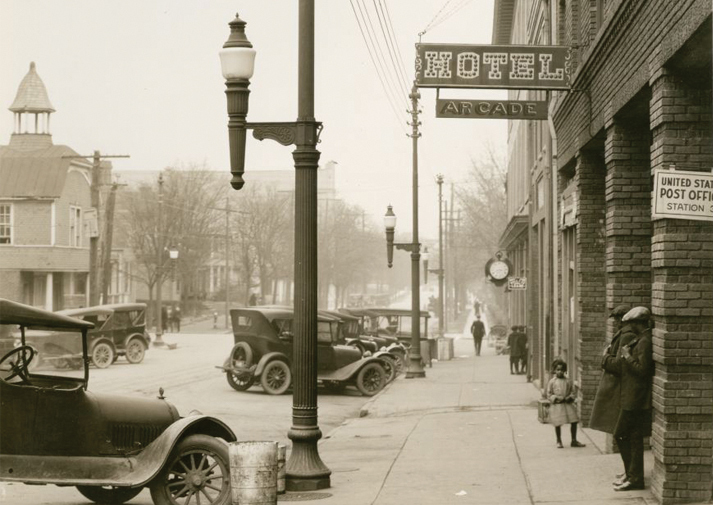 Haywood Street Congregation sits in a section of downtown Asheville that has escaped the city’s commercial boom. That makes it a good place for homeless people. The new hotels keep rising in Asheville, and the nice restaurants keep opening, but good jobs are hard to find. So are cheap beds. 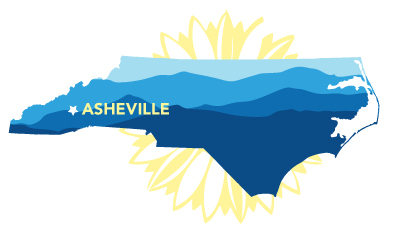 Asheville has an apartment vacancy rate of 1 percent and the most expensive rental prices of any market in North Carolina. With wages low and rents high, the city’s homeless population continues to climb. Just up the road from Haywood Street are an emergency overnight shelter, a day shelter, and an agency that places the homeless in permanent housing. 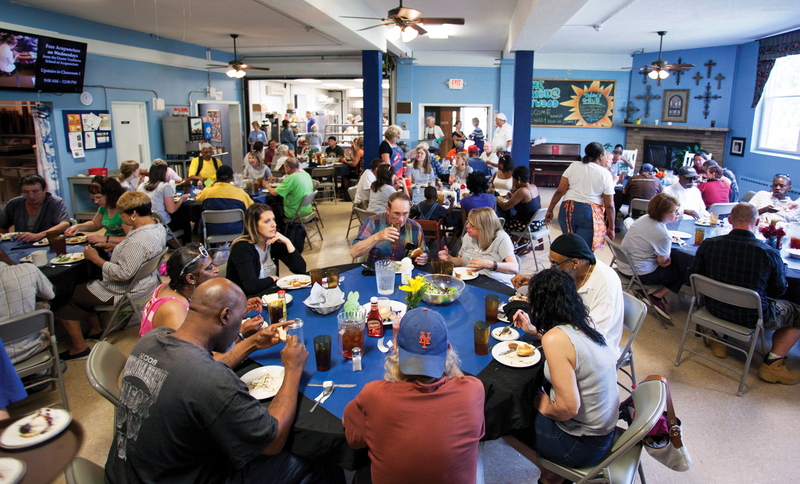 In addition to twice-weekly worship services, the Haywood Street Congregation operates a clothing closet, a community garden, and short-term lodging for homeless people recently released from the hospital. The church’s defining institution is the Welcome Table. 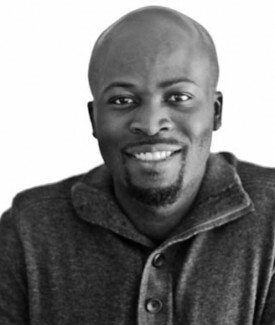 Watch Piko Ewoodzie on “Setting the Homeless Table” at the 2014 SFA Fall Symposium. 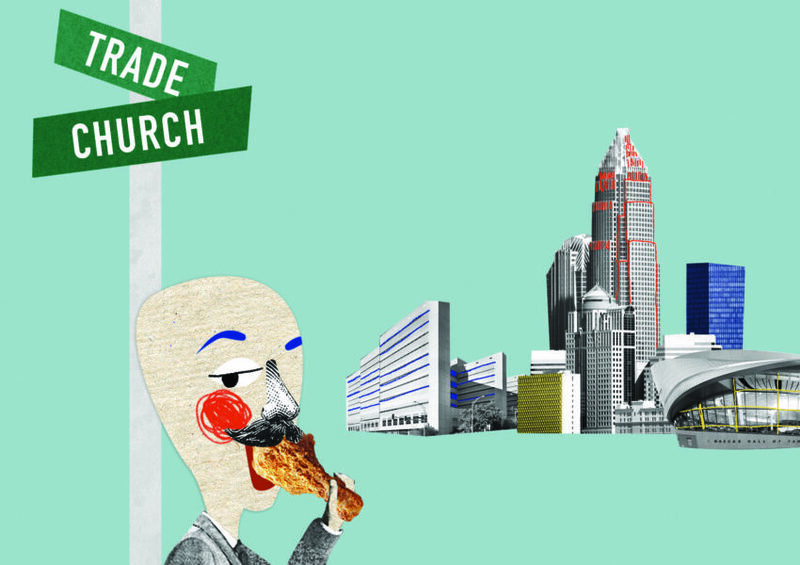 The church fits right in—and stands apart. Part of the United Methodist Church, it was founded by Rev. Combs—generally known as Pastor Brian—in 2009. In addition to twice-weekly worship services, the Haywood Street Congregation operates a clothing closet, a community garden, and short-term lodging for homeless people recently released from the hospital. The church’s defining institution is the Welcome Table. 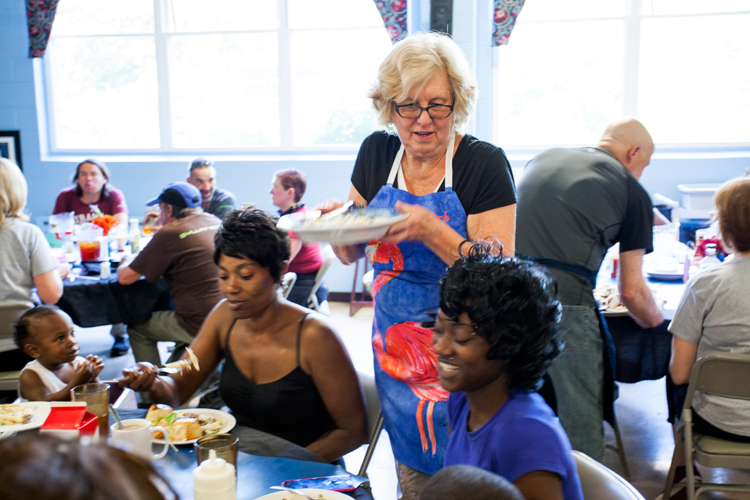 It is not a soup kitchen, a breadline, or a food pantry. It’s a sort of restaurant, serving a free, family-style, sit-down meal twice each week, complete with tablecloths and silverware. Everyone is invited. And sometimes it seems that everyone comes. The Welcome Table serves as many as 600 meals a week, in six seatings, to one of the most diverse groups of people I have ever seen at table. An older man with an expensive haircut and black-framed glasses. Couples with babies. Young men carrying backpacks, neatly loaded, ready for another night of camping in the woods along the river. High-school boys wearing bow ties. A man with a weathered face and a teardrop tattoo at the corner of his eye. A tall, skinny kid in his late teens, shirtless and shaking as he comes down from whatever he’s on. A construction worker with his hard hat tucked under his chair. Gray-haired church ladies in cardigans. A young man with a crew cut and a bone-handled hunting knife strapped to his belt. A piano player entertains guests. Banquet steward Dave Holland. All photos by Erin Adams. The homeless and the housed, the poor and the prosperous sit down together to share a meal. 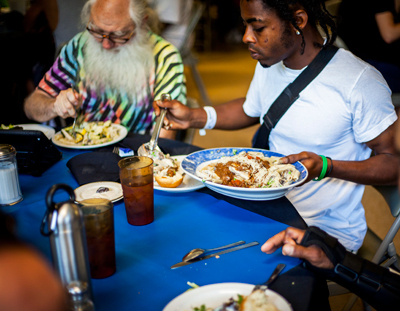 The homeless and the housed, the poor and the prosperous sit down together to share a meal. “It’s what Christ would do,” Holland said. I embraced the social message, but the Jesus talk posed a problem. Despite my twelve years of Catholic education, I have moved beyond lapsed Catholic into a category of unbelief I once heard described as “collapsed Catholic.” When, on my first day as a Welcome Table volunteer, I saw a man wearing a three-inch wooden cross and inviting people to small-group prayer, I got a little twitchy and started eyeing the exits. But then I noticed the other volunteers in action, dispensing sweet tea and hugs to all comers. I was reminded that not all Christians promote and defend bigoted laws about bathroom use. The Jesus of the Gospels, the Jesus praised at Haywood Street, broke bread with “the poor, the maimed, the lame, and the blind,” as the Gospel of Luke says. 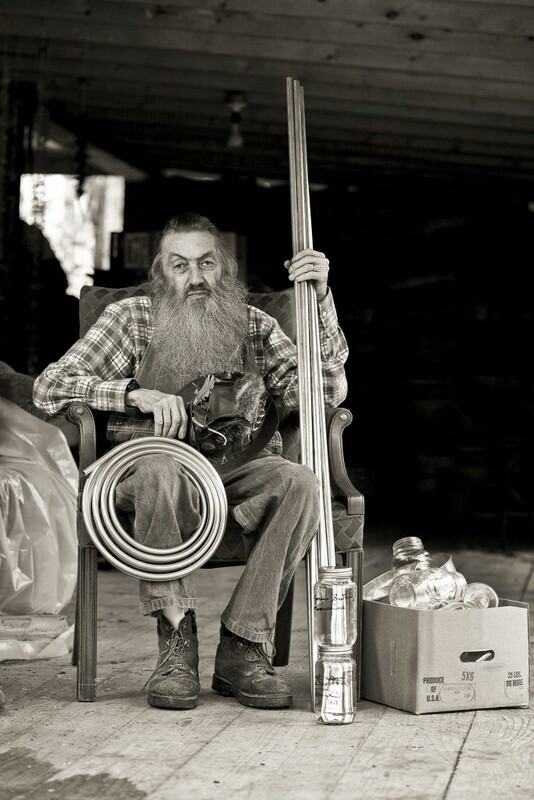 Read Essig on legendary moonshiner Marvin “Popcorn” Sutton for Gravy. That’s my kind of Jesus. In theory, at least. In practice, I had a hell of a time sitting down at the Welcome Table. Pastor Brian likes to point out that one of the most important volunteer jobs is to sit and eat. Many of those dining at the Welcome Table suffer from addiction and mental illness. Staff members describe the environment as “holy chaos.” To the untrained eye, that unruliness is hard to distinguish from the ordinary variety. 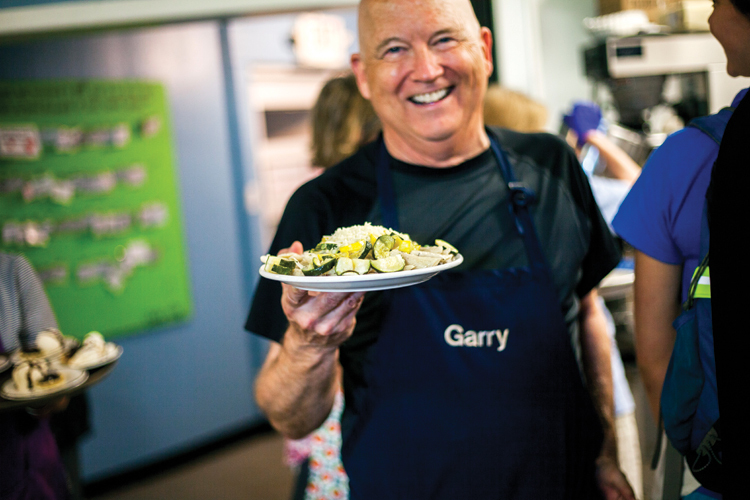 Church employees and veteran volunteers—a group that includes churchgoers, unaffiliated locals, the formerly homeless, and the homeless themselves—approach disorder and distress with a practiced, compassionate calm. A man who is shouting or stumbling or cursing is shown not to the door, but to the table, and then others sit beside him and offer soothing words or quiet company. When the chaos starts, the easiest response is to avoid the scene, to start wiping tables and cleaning floors. 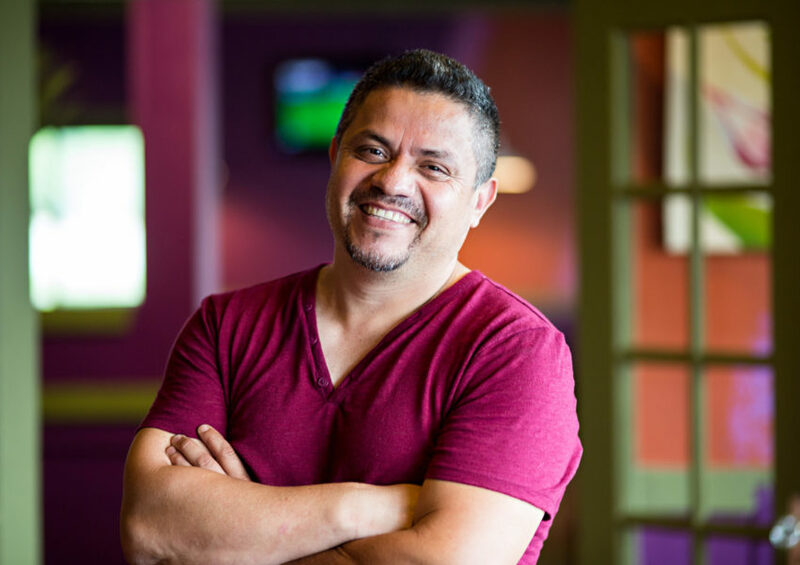 “The hardest thing to do is to sit, to be present,” Pastor Brian said. That proved correct. I started volunteering in October and dutifully appeared week after week. Each Wednesday morning I vowed that I would sit and eat, and each Wednesday afternoon I picked up a broom instead. As a native Midwesterner of German extraction, avoiding conversation comes naturally to me. When dining alone, I avoid sitting at the bar for fear that strangers may talk to me. As I looked around the dining room at the Welcome Table, I saw people I recognized, but didn’t know, including the young woman whose requests for money I had often refused, the man with the white beard who spent nearly as much time escaping the cold in the Whole Foods café as I did tapping at a laptop, and the traveling kids who busked downtown and whose dogs I warned my children not to pet. These were people I avoided, not ones I joined for a meal. Those gatherings functioned, as all meals do, as a statement of solidarity: When we eat together, we acknowledge a shared identity with the others at the table. Some of the earliest Christians displayed a reluctance not unlike my own. In the century after Jesus’s death, St. Paul scolded the Christians of Corinth over their meal practices. At the time, the Lord’s Supper was not purely sacramental. Christians didn’t gather for a ritual sip of wine and a bite of bread. Instead, they joined together for a real meal. Those gatherings functioned, as all meals do, as a statement of solidarity: When we eat together, we acknowledge a shared identity with the others at the table. In an essay called “Deciphering a Meal,” the anthropologist Mary Douglas explains that in her social realm she could offer drinks to “strangers, acquaintances, workmen,” but that “meals are for family, close friends, honored guests.” Sharing food, she writes, defined “the line between intimacy and distance.” Early Christians sought to redraw that line. Christ had called for his followers to create a community that brought together women and men whose social status, ethnicity, and religion varied widely. By sharing a meal, they forged a community. The Corinthians kept getting it wrong. For their suppers, each member of the community brought food from home. The dishes were meant to be pooled and shared equally. Instead, the wealthy kept the good food for themselves. They turned potluck into brown-bag. The Lord’s Supper was intended to unite “Jews and Gentiles, slaves and free men,” Paul wrote. Instead, the wealthy chose to “humiliate those who have nothing.” Paul’s letter to the Corinthians put it this way: “When you come together to eat, wait for one for another.” In other words, share. The fear [of homelessness], in other words, intensifies as the social distance narrows. Those closest to the edge feel the need to keep their distance from those who have already tipped over. 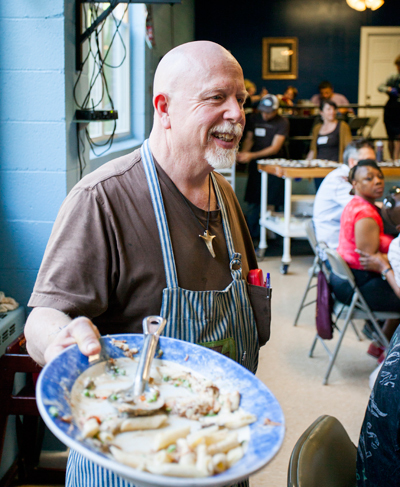 Eric, who has been homeless for three decades, works the dish-room pass. Stationed at the window, he slides bus tubs and glass racks back to the dishwashers. After the meal, he cleans and sweeps and mops. “A lot of people think homelessness is contagious,” he told me. At first I thought he was talking about people like me and the wealthy Corinthians, uncomfortable at the prospect of sharing a meal with people like him. But he had something else in mind. “People are working paycheck to paycheck,” he said. “If they lose a job, they’ll be homeless, too.” The fear, in other words, intensifies as the social distance narrows. Those closest to the edge feel the need to keep their distance from those who have already tipped over. Essig on how science and marketing rebooted the pig in Gravy. Photo by Chris Fowler. The Welcome Table serves no cold pizza. The standard meal is a meat-and-three, with roast beef or chicken or pork and sides. At least once a month, a local restaurant cooks the food. Those menus tend to be ambitious: butter chicken and salad with cumin-lime vinaigrette; barbecued shrimp and grits with chow-chow; pork shoulder ragù and grilled brassicas with chili, garlic, and anchovy paste. Chefs at several of the participating restaurants have been semifinalists for James Beard Awards. They honor the spirit of the Welcome Table by serving sophisticated food, for free, to all. On those occasions, the men and women who dine honor that same spirit by largely ignoring the star power of the visiting chefs. The conventions of fine dining do not hold at the Welcome Table. I saw half-smoked cigarettes tucked behind ears and chewing gum stuck to the edges of plates. One day a man to my left served himself chicken and root vegetables before pulling a pint container of cantaloupe from his bag and tumbling cubes of fruit atop his other food. When he finished, he offered it around the table; we declined. Quite a few guests pack up doggie bags even before they eat—slices of roast beef folded into napkins and slipped into pockets, chicken legs squeezed into plastic clamshells. One day a woman named Candice sat next to me. She plated barbecued pork, beans, slaw, and cornbread, and then slid it off the plate and into a grocery-store produce bag. “It’s all going to the same place,” she said, before explaining that she had to rush off to an appointment to sell some of the jewelry she made. On the other side of me that day, a man named Darin spooned pork, slaw, and beans into three separate cottage cheese containers. He told me they were for his eighty-five-year-old mother, who had stayed home. He packed tiny portions, barely enough to cover the bottom of each container. “She won’t eat much,” he told me. 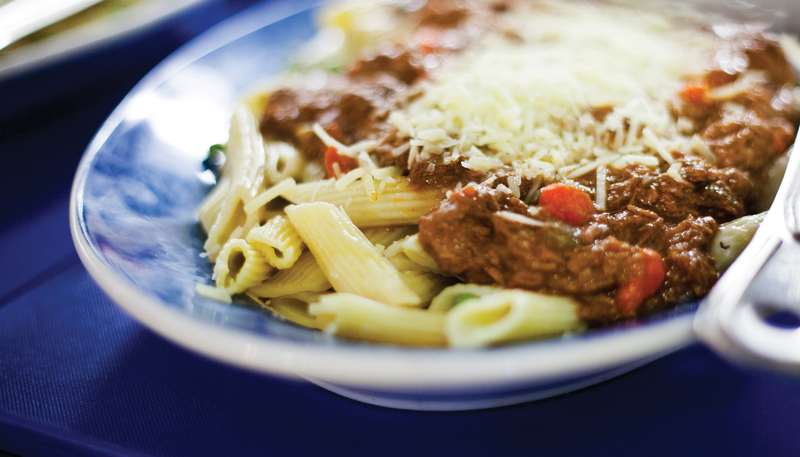 “I tell her she has to eat.” Darin slipped his mother’s food into his backpack, then plated up his own meal and picked up a fork. Mark Essig is the author of Lesser Beasts: A Snout-to-Tail History of the Humble Pig. His essay on Popcorn Sutton appeared in the fall 2015 issue of Gravy. 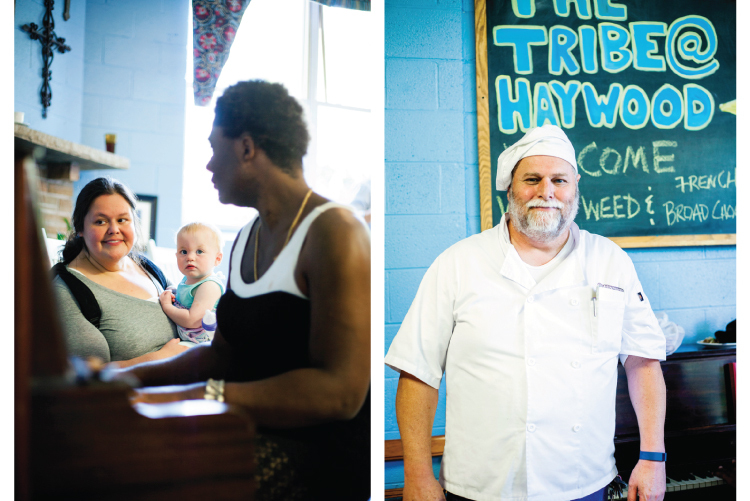 People come from across Charlotte to eat Aunt Beaut’s pan-fried chicken at The King’s Kitchen.